This pattern is designed by Laura Kramer Doyle and is in leaftet number 392 published by Sudberry House. 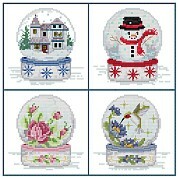 This pattern displays snow globes for the Winter season, there are four snow globes in all. This pattern inlcudes Full stitches, 3/4 Stitches, French Knots and Backstitching.